In collaboration with the responsive dental website team here at Rosemont Media, Dr. Pat Cuozzo recently developed a brand new site with a range of tried-and-true design elements, along with some interesting new ones. Viewers searching for information on traditional braces, Invisalign®, orthodontics for adults, orthodontics for children, and many other treatment options will find a thorough educational resource on Dr. Cuozzo’s new site. Plus, with its responsive design, the site is easily readable across a broad array of digital platforms – including laptops, desktops, smartphones, and tablets – without sacrificing content or ease of navigation. In addition to a comprehensive biography, detailed descriptions of procedures, and a before-and-after gallery, Dr. Cuozzo has a custom-designed page to showcase his unique “Next Cuozzo Star” contest. The site also features video FAQs, patient testimonials, and photos of actual Cuozzo Orthodontic Specialists patients prominently displayed on the home page and in headers on multiple pages. Dr. Cuozzo’s new website is fully optimized utilizing some of the latest dental SEO strategies to help the practice stand out in his market. With optimized content, advanced design features, and a narrative tone that is both educational and user-friendly, Dr. Cuozzo and Rosemont Media have created a gem of a new website that gives patients an exciting virtual tour of the practice. 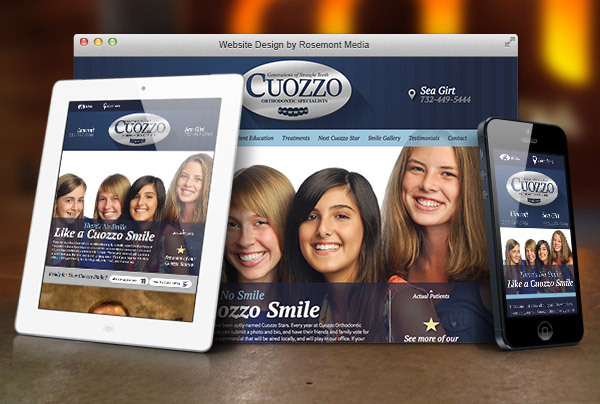 You can view Dr. Cuozzo’s website at www.4straightteeth.com, and we welcome you to contact Rosemont Media today to learn how you can enhance the online profile of your practice.